America's fabled "Left Bank," Greenwich Village in New York City has been described, lauded, idealized and immortalized in numerous books — but here, for the first time, prize-winning journalist Robert Schulman tells the story of perhaps the Village's most vibrant citizen, the redoubtable Romany Marie Marchand, the acknowledged Earth Mother of the whole scene. From 1914 until the late 1950s she literally set the table for the 20th century's American bohemian elite by running a series of taverns in the Village and establishing a creative hotbed for their ideas and innovations to play out. To these places came Buckminster Fuller, Will and Ariel Durant, e.e. cummings, Theodore Dreiser, John Sloan, Burl Ives, Zero Mostel, Edgar Varese, Brancusi, Isamu Noguchi, Diego Rivera and hundreds of other shining lights of literature, art, theater and academia. At Marie's taverns they found welcoming, fertile spaces where their ideas took root. "You know what I am to them?" asks Marie. "I'm a legend. I'm an idea. Many times, when such people get together, the thing they do is to talk about me and to reminisce. Where they started, how their work began. Oh yes, they'll say, was that in Marie's Washington Square place, or in the one on Christopher Street? They can scarcely speak of their past without bringing in one of my centers, for that is what my places were — not so much restaurants as centers for people to get off the edge of the ordinary." 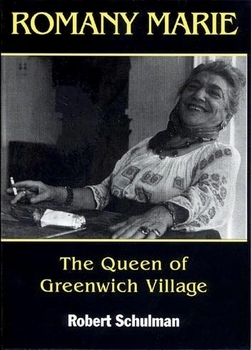 Derived from the exhaustive interviews conducted by Marie's nephew, Bob Schulman, first begun in the 1940s and now finally complete, Romany Marie: The Queen of Greenwich Village offers a fascinating and colorful glimpse into America's true Bohemia in the only way it can truly be offered: by one of its most influential and omnipresent members. Bob Schulman was a newsman ever since his student days at New York and Columbia Universities. During his growing up years in New York City, he made many visits to the various Greenwich Village bistros where his maternal aunt, Romany Marie Marchand, held forth. And during his years in journalism in the Midwest, South and Pacific Northwest, whenever he was in New York, he taped her rich lode of recollections and interviewed many of her devotees. Schulman was a newspaper reporter and feature writer in St. Louis, and a staff correspondent in Chicago for Time, Life and Sports Illustrated magazines. In Seattle he had responsibility for news in four states and Alaska; this was followed by a prize-winning television documentary career in the Northwest. In the late 1960s Schulman shifted to reporting and commentary for the newspapers in Louisville, Kentucky and the TV-radio stations owned by the Bingham family. In that capacity he garnered a national award for one year's best TV editorial, and for eight years wrote a newspaper column that was among the nation's first to turn a critical eye on the media. For 10 years he was co-host of "Good Authority," a weekly program on Louisville-area radio commenting on regional happenings. He was also the author of John Sherman Cooper: Global Kentuckian, published in 2004. Schulman lived in Louisville with his wife, Louise, until his death in January 2008, at the age of 91.